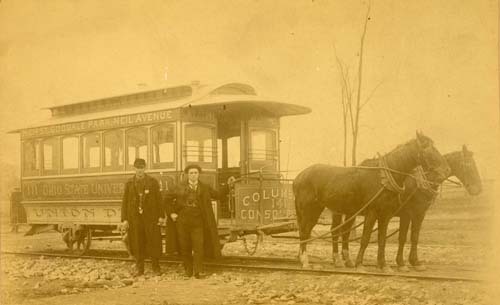 Horsecar #141 was one of the last horsecars purchased by the Columbus Consolidated Street Railway Co. When the horsecar lines were electrified the best horsecars like #141 were used as trailers. The Columbus, Ohio, horsecar era started in 1863 with a line from Columbus Union Depot on North High Street past the new State Capital building at Broad and High Streets to Mound and South High Streets, a distance of about one and a half miles. The beginning of the end for the horsecars came in 1888 with the start of electrification and it was all over by 1892 with the conversion of the last horsecar line, the Oak Street line, to electrified streetcars. The horsecar era lasted 29 years. During that time the Columbus population grew from 18,000 to 90,000. 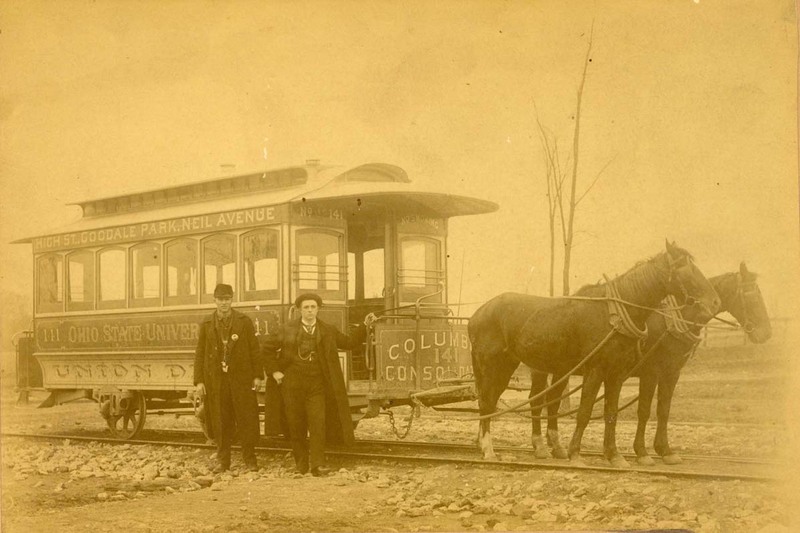 The horsecars made it possible for Columbus to grow beyond a comfortable walking distance from the central commercial area located on High Street giving rise to the streetcar suburbs. That first 1863 line grew from approximately 1.5 miles to multiple routes encompassing two streetcar companies (The Columbus Consolidated Street Railway Co. and the Glenwood and Green Lawn Railway Company) for a total of 34.5 miles. That original High Street line remained the core of the system with most new routes radiating east or west from High Street. The horsecar lines established the basic layout for the electric street railway that followed in the 1890s. 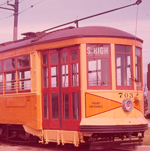 In 1888 an experimental electric streetcar line was built in Columbus, Ohio. It ran on Chittenden Avenue from High Street to the State Fairgrounds, a distance of about half a mile. From that shaky start it only took until 1892 to completely replace the horsecars. The advantages in speed, cleanliness, increased capacity and economy caused officials to put those horses to pasture as fast as they could. For the next 54 years Columbus would rely on the electric streetcar for basic transportation around the city and to promote city growth. The name for the streetcar company changed over the years. At the time of the conversion to electric there were two companies, The Columbus Consolidated Street Railway Company which was the dominant company and the Glenwood & Green Lawn Railroad Company which ran the West Broad Street and Green Lawn cemetery lines. As soon as the G&GLR Co. electrified it was taken over by the CCSR Co. In 1892 the CCSR Co. was reorganized as the Columbus Street Railway Company. In 1893, in another move the streetcar and electric light business was brought together and called the Columbus Railway & Light Company. In 1904 the company became the Columbus Railway, Power & Light Company. In 1937 the company became known as the Columbus and Southern Ohio Electric Company. In 1933 a modernization program was started that introduced trolley coach and motor bus service. This transition away from streetcars was completed in September, 1948. 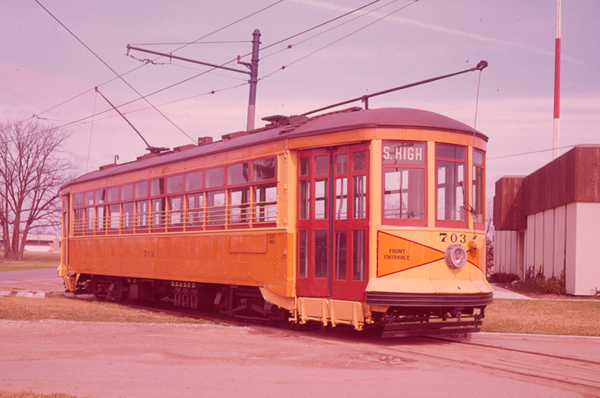 This fifteen year modernization program is described in 1948 End of The Streetcar Era.